SwiftKey, is one of the popular Android Keyboard maker has released a new version 4.2 with major updates. The new app is now available as beta version and called SwiftKey Cloud that supports the most expected feature of Backup and Sync your personal data to use in various devices. The app has new features including cloud backup or backup and sync support, Trending phrases and enhanced personalization. • Backup & Sync - All of your personal data such as words, phrases and other settings will be securely backed up on SwiftKey cloud server. Your personalized data will be synced when you are using a new phone or tablet or any other devices. 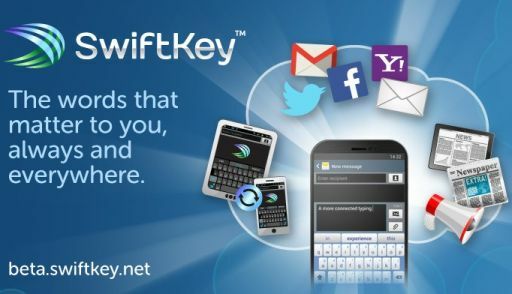 • Trending Phrases – SwiftKey analyzes the latest happenings on Twitter, Facebook and other news sources and provides you new words related to daily discussions and trending topics like sports, news events or gossips. • Enhanced Personalization – SwiftKey presents you the words from your writing style so you get the next word predictions and auto corrections that are completely tailored to you. There are Gmail, Facebook and Yahoo Mail personalization can be authorized in just one click. The SwiftKey 4.2 Cloud app is now available as beta version. The existing users and new users can get these features will be part of a free upadte called SwiftKey 4.2, when the beta testing is complete.